Solid dosage form manufacturers have long relied on shape and color as well as on-pill imprints of logos, product names, or numbers for product identification. But in these days of heightened counterfeiting concerns, the industry has a growing interest in adding more difficult-to-duplicate features to the pool of existing product identification techniques. Added security is particularly important on high-profile or high-cost drugs, as well as on pharmaceutical products supplied in bulk for repackaging. Advances in marking, coding, and inspection technology have led to the development of new anticounterfeiting tools for drug makers seeking ways to protect products that are in pill form. The best of these versatile tools help build brand identity and prevent medication errors at the same time by making the product more distinctive. Because drug makers are always concerned about making postapproval changes to the drug product, the US Food and Drug Administration is working on a guidance that will clarify, and perhaps minimize, notification requirements for manufacturers that want to add anticounterfeiting techniques to their drug products or packaging. The United States Pharmacopeia also has been studying the imprinting of solid dosage forms to identify ways to improve product identification. Its focus, however, appears to be more on improving patient compliance, reducing medication errors, and preventing response delays to poisoning incidents. Color-changing ink. Some companies are experimenting with using a combination of color-changing materials and laser beams to apply tiny two-dimensional Data Matrix codes or other information such as dosage level directly onto a tablet. The technique, which is patented in Europe and the United States, involves the application of a food-grade, color-changing material as a coating or a coating additive by means of standard spray or tumble methods. When exposed to a low level of energy from a carbon-dioxide steered beam laser, the color-changing material turns black. These lasers, also known as scribing or vector lasers, operate in the far-infrared range and generate a 10-mm spot of energy. Using this tiny beam, sophisticated control, and appropriate software, drug makers can apply various images including logos, numbers, and Data Matrix codes as small as 0.5-mm square to the product. Codes of this size are difficult for counterfeiters to duplicate. As an additional hurdle for counterfeiters, a different Data Matrix code can be applied to each tablet. Evaluations of the method are currently underway by pharmaceutical manufacturers and suppliers of coating and tablet production equipment. Commercial applications are expected before the end of 2006. Future developments could result in the application of microscopic photographic images on solid dosage forms, a concept that has already been prototyped. 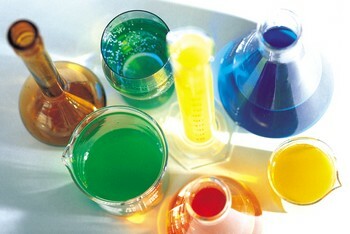 Other advances are likely to center on food-grade formulas that transform into colors other than black when exposed to laser energy (DataLase Edible Laser Imaging Chemistry, Sherwood Technology Ltd., Widnes, UK, www.sherwoodtech.com). Microscopic markets. Another way to authenticate solid dosage forms is by means of inexpensive, edible microscopic markers that carry dense, easy-to-read information. Markers are mixed with a liquid coating to enable spray-on application. Each marker has an irregular "Pac Man" shape and measures approximately 16 [micro]m in diameter and 4 [micro]m thick, or nearly half the size of a human hair. Irregularities around its circumference form a pattern that can carry data. The patterns may be read under a microscope or with pattern-recognition software in machine vision systems and sensors that link to a database for authentication. The technology also offers multiple levels of security because modified markers can detect physical, chemical, or biological threats to drug products (Invisible Security Marker, Adhesives Research, Inc., Glen Rock, PA, www.adhesivesresearch. com; Burntside Partners, Inc., Ijamsville, MD, www.burntsidepartners.com; reader-database, Complete Inspection Systems, Inc., Indialantic, FL, www. completeinspectionsystems.com). Invisible tags. Optically and forensically invisible markers (or taggants) are virtually impossible for counterfeiters to detect and therefore are difficult to reverse engineer. These odorless, colorless powder taggants are made from an inorganic material and are used at levels of less than two parts per million. In other words, 1-g of taggant will cover a 30,000-[ft.sup.2] coating area. As taggants flow with the coating fluid they arrange themselves in random patterns that can be decoded by a proprietary, pen-sized electromagnetic reader. The reader uses edge-detection algorithms to record and identify the image in 16-20 bits of code. A billion unique codes can be stored in a 0.5 GB of memory. A plug-and-play database system provides track-and-trace capability from a standalone personal computer or as a bolt-on module for an enterprise resource planning system. Although the tiny taggants are currently targeted for packaging materials and labels, they are expected to be cleared as an acceptable component in drug formulations by 2006 or 2007 (Creo Traceless Security and Authentication system, Creo Inc., Vancouver, BC, Canada, www.creo.com). A multifaceted anticounterfeiting solution--which consists of a combination of visual, electronic, chemical, flavor, and aroma identification--allows overt and covert tools to work in tandem, thus providing drug makers another safe way to protect their products from counterfeiters. For example, a visual tool such as a hard-to-duplicate pearlescent coating may be combined with an electronic identification tool such as a two-dimensional bar code or a covert barrier (i.e., edible chemical markers that are invisible to the naked eye). In addition, flavor and aroma film coating additives provide unique profiles and an additional level of authentication. Film coating, colorant technology, and high-definition printing and imaging systems are central to the implementation of these tools. Transitioning to one or more of these technologies may necessitate an investment in printing and scanning equipment, but should add only a fraction of a cent per tablet in material costs (Security inks and coatings, Colorcon, West Point, PA, www.colorcon.com). Pearlescent coatings are available in several custom colors and provide a distinctive appearance that enhance product branding and provide positive identification at all supply chain levels. Strictly controlled production secures supplies. Several bar code inks have been tested and proven to reproduce scannable Data Matrix codes. Successful combinations include white ink on a purple film coat, black ink on a red film coat, red ink on a yellow film coat, and black ink on a white film coat. Code size and tablet shape also affect scannability. Tests show that the minimum size for a Data Matrix representation of a national drug code ranges from 2.5 [mm.sup.2] for a flat tablet to 4.0 [mm.sup.2] for a solid dosage form with complex curves. Bar codes can be combined with logos or numbers to enhance recognition. With today's high-resolution printing, logos can even incorporate coded images to provide a product fingerprint (i.e., a covert chemical marker added to the film coating). Such a marker provides a means to authenticate the two-dimensional code and might contain additional information such as manufacturer, expiration date, and distribution channel. Ink-jet printing. Food-grade inks combined with an ink-jet printing system capable of high-definition microprinting can produce alphanumerical, two-dimensional codes with print heights of 0.8 mm. Such systems accommodate product moving at 308 m/min. (Pinpoint inkjet coder with food-grade ink, Domino Printing Sciences PLC, Cambridge, UK, www. domino-printing.com). Variable data can be printed on tablets using thermal inkjet technology and food-grade inks. Printing may take place on- or off-line. Variable data not only provides an authentication tool, but also enhances track-and-trace capability to meet electronic pedigree initiatives (Print-on-tablet technology, HP, Palo Alto, CA, www.hp.com). Additional two-dimensional codes. Other two-dimensional codes also have potential for tablet marking. The technology behind these printed codes is based on image recognition principles and chaos theory. The printed marks may be applied to smooth, rough, curved, or flexible surfaces by means of laser. Data capacity ranges from 7 to >30 d; codes as small as 0.1 mm, which is invisible to the naked eye, can be produced. Scanning requires a contrast of less than 10% between the code and its background and may be performed at speeds as fast as 12,000 codes/h with commercially available equipment (2DMI, ORBID Corp., San Francisco, CA, www. orbidcorp.com).